Come and see a very special photographic exhibition dedicated to celebrating 'Māori Modernism'. As Part of Auckland Heritage Week, we focus on the historical past of Māori Modernist artists and their legacy of public works in Auckland city centre. Māori modernism, a contemporary movement in Māori art, emerged during the 1960’s. Contemporary Māori artists forged a new and modern national identity of fresh art forms imbued with indigeneity. The city Centre has a significant collection of legacy public works made by five Māori artists at the forefront of this movement. 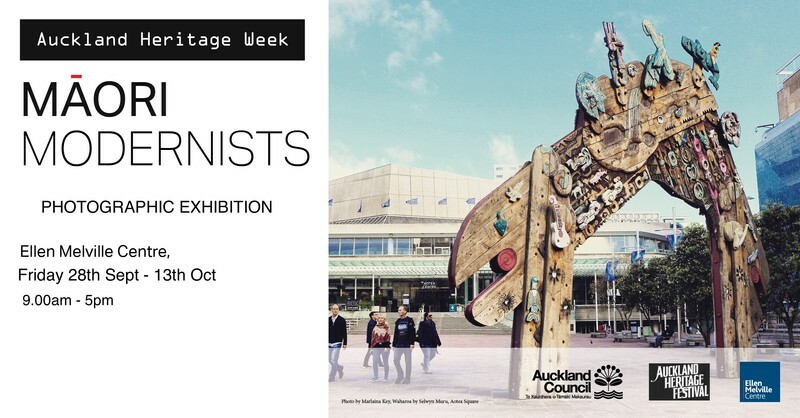 This photographic exhibition celebrates the artists, Ralph Hotere, Fred Graham, Selwyn Muru, Paratene Matchitt and Arnold Manaaki Wilson, and their works that are part of the city center public art collection. Photographs of the five artists and photographic images of their art will be on display at the Ellen Melville Hall for the duration of Heritage Week. The Ellen Melville will also host a public talk, and guided walk of the art works by leading art historian and curator Linda Tyler. Please come along to the free public talk on Saturday 13th of October, starting at 10.30am, then Linda will lead a walk and talk through artworks around the city centre. *Please note bookings for just the walk are limited and booking are through Eventbrite.